As flood waters inundate many Victorian towns, VicRelief Foodbank has already provided more than 20,000 kilograms of food and material aid to aid relief efforts. At the beginning of this week VicRelief Foodbank began working with local emergency relief providers to increase the quantity of food and the amount of deliveries available to flood affected areas, including Echuca, Horsham and Kerrang. Deliveries this week have included mineral water, UHT milk, bread, margarine, fresh fruit and cheese. Much of this food was airlifted into Victoria’s isolated communities including Charlton and Boort. VicRelief Foodbank are currently working to get additional donations of UHT milk and canned meals that do not require cooking should power supplies be compromised. They will continue to support emergency relief efforts even after the flood waters have subsided. 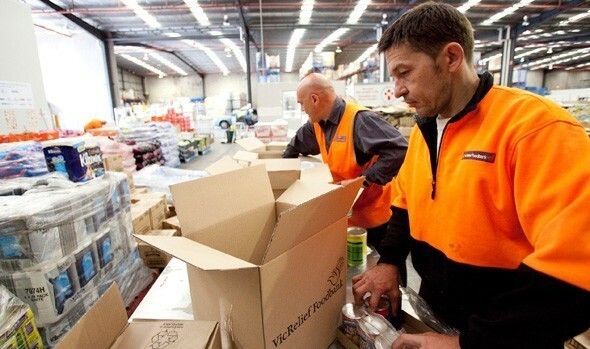 VicRelief Foodbank is also continuing to provide emergency relief to flood victims in Queensland. Yesterday a shipment of 30,000 kilograms of food was sent to Queensland, and the organisations says a further 20,000 kilogram shipment will be sent as soon as the Foodbank in Queensland are able to accommodate it. VicRelief Foodbank praised the generosity of Foodbank Queensland, who in spite of being in urgent need of food relief, have been good enough to share donated food with VicRelief Foodbank, so that it can be used to aid relief efforts within Victoria.